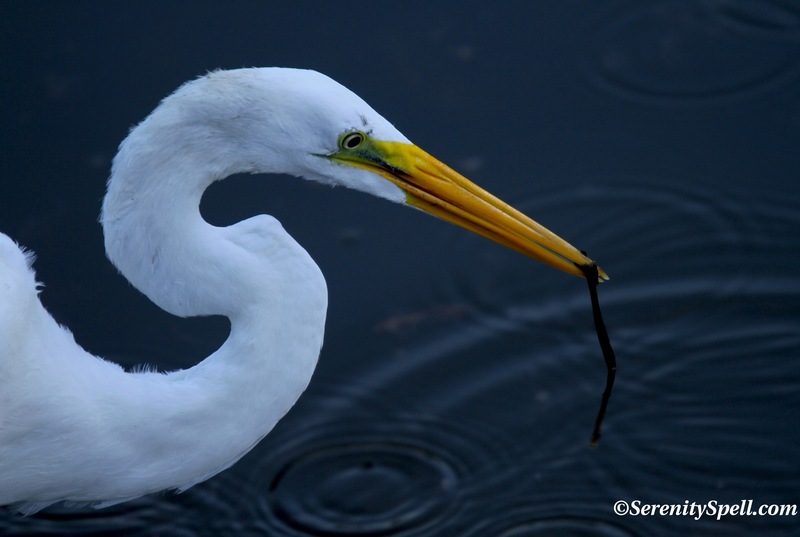 One of the birds I most enjoying watching in our wetlands and swamps is the Great Egret. It’s hard not to be captivated by these creatures — the epitome of ethereal beauty, grace and strength, they wade, stalk and fly in our waters with balletic poise. They’re the largest egret in the Old World — thus the great of their title. In the New World however, Great Blue Herons win the size competition. 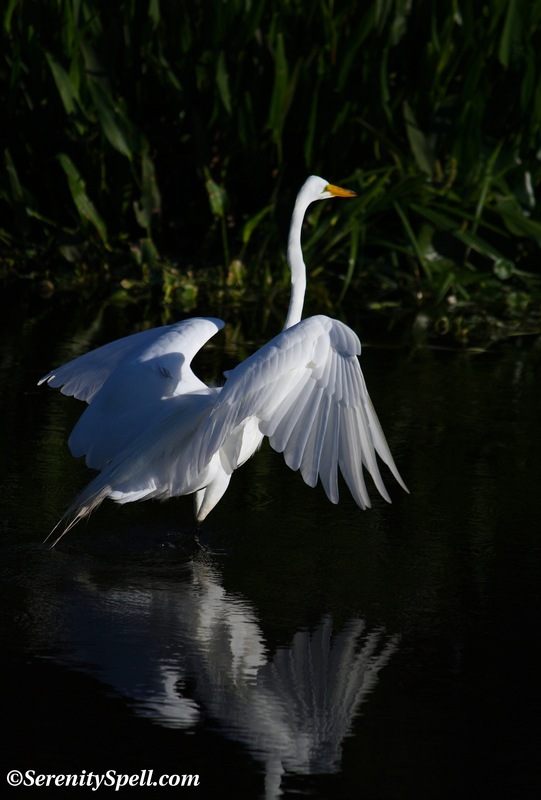 I recently watched one lovely Great Egret hunting at dusk in our nearby Everglades preserve. Boasting brilliant all-white plumage, the feathers of the Great Egret are stunning, almost unreal; sadly, these beautiful birds were hunted mercilessly towards the end of the 19th century — nearly to the point of extinction, their numbers decimated by 95 percent. Their breeding plumage was especially prized, and their treasured feathers were used in hats across the globe. During the breeding season, the Great Egret displays long, elegant plumes on its back, which are used in courtship displays. During this time, the lore (the area between the bill and the eyes) also turns a vibrant green (see The Greening of The Great Egret). But with conservation measures enacted, their numbers grew throughout the 20th century. While wetland habitat loss is once again threatening their existence, these birds have a high adaptability to human habitation. Of course, the loss of wetland ecosystems remains another issue altogether for other wildlife and flora…. Stunning pictures. We have many egrets where I walk my dog – I feel lucky. Thanks so much! I’m always captivated by these lovelies… I’ll sit and watch them for a good amount of time. Very calming! You’ve taken some amazing photographs!! Love the Great Egret!! I see them fairly often around the beach here, but never tire of watching their grace and beauty! I adore these guys — they’re thoroughly captivating. I spend lots of time just watching them; it’s very soothing to the soul. Their bright white gleaming against the swamp is magical. You’re lucky to be able to do the same! Thanks so much — They are the best fishermen! Interesting that you mention size and the use of Great in the common name. Size does seem to play a role in the very confusing and changing taxonomy for the family Ardeidae. Herons are larger (Great Blue Heron as you mention) and generally are of the genus Ardea and Egrets are smaller — genus Egretta. But the Great Egret or Great White Egret seems to be caught in the middle as even its genus is Ardea not Egretta. If egrets are the herons that have the aigrettes or tufted gauzy breeding back plumes….then the Great Egret is the largest of those. Sooo size matters!! 🙂 Taxonomy is supposed to unify science but like the species it tries to define, it evolves too. Gorgeous pictures of a beautiful Great Egret!! People are fascinated with the elegant white birds of the wetlands. You explain it very well, THANKS — and it’s odd how they’re caught in the middle like that, like you say… The classification changing throughout the years. They don’t know where to put these guys, do they? The second photo is just fabulous. What a fantastic, crisp capture with the reflection. Thanks!! I adore the span… I’m always entranced with the strength and delicacy of these birds’ wings and feathers. Amazing creatures. I love that second one, too! Just stunning. Thanks so much! I adore their wingspans — the simultaneous strength and delicacy of the musculature and feathers. A beautiful bird and a great hunter. You can sense the poised, ready to strike tension of the Great Egret in your first photo. Watch out frog, or whatever was on the menu! Your photos of the egret are excellent. I can’t tell you how many times I’ve returned home after photographing egrets only to discover that I’ve blown out all the highlights. DOH!!! I wonder what it would be like if people had necks like the one in that first photograph. In the second picture, the egret is so bright that the resulting photograph almost seems black and white. It’s great that you caught the bird at the moment of takeoff. Hah!! I think of ballet dancers when I see these guys sometimes… Some of the herons will actually choke to death in attempting to swallow critters to large for their delicate throats, though. Eyes too large for their stomachs! SO elegant, aren’t they? They stalk so slowly, then with lightning speed… They’re amazing predators! So beautiful! In California, we have Snowy Egrets – they are so small and light, they balance on patches of kelp in the middle of the ocean, waiting for the unfortunate fish. We’ll see them on the shore as well, mingling with seagulls, trying to gauge the tides, trying not to get their fabulous bright yellow feel wet. Ah yes! We also have the snowies, here… They’re gorgeous! I love them. The ARE very delicate things — and I love how you describe their fabulous fishing techniques, hee!